This week's tablehopper: meatses partses. Killer app: Sichuan ‘nduja with shrimp chips at Fung Tu. Photo: © tablehopper.com. Hi there! It’s a sunny day in New York, and I am feeling a twinge of spring in my step—I even got to enjoy a fantastic Taim falafel while sitting at a sunny playground on Sunday! Felt so good to just sit outside. But the forecast also has some upcoming snow, so there’s that. So schizophrenic, NYC! I hope you got a chance to see my pics of Maison Premiere in Williamsburg, what a stunning and delicious and thirst-quenching place. I had a busy week writing two pieces about buttery items for Time Out USA: six crazy-delicious and creative croissants and the top baked goods America is obsessed with. Any more I should be aware of? I can’t believe how much work and email I gotta deal with right now, so I’m off. Hope you are holding down the fort for me! Peeking through the window. Photo courtesy of Wise Sons Bagel & Bakery. Probably one of the most anticipated projects this year, Evan Bloom and Leo Beckerman just opened ~WISE SONS BAGEL &AMP; BAKERY~ last Friday February 26th. 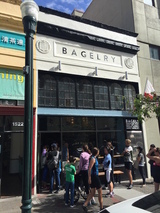 We have been tracking this one for you for a while, but here’s a quick recap for you: this is the Fillmore location of their 2,200-square-foot commissary kitchen, production bakery, and shop, where they will be making thousands of bagels (you can find them at all Wise Sons locations now, including the Contemporary Jewish Museum and 24th Street deli, plus their stand at the CUESA Farmers Market on Tuesdays, Thursdays, and Saturdays). There are currently five kinds: plain, sesame, poppy, salt, and everything ($2 each), plus a bialy. There’s a counter where you can order bagels, all kinds of schmears, bagel sandwiches, baked goods (hello, babka! ), and coffee and espresso drinks (they’re using Intelligentsia). The smoked fish lineup includes some selections from the same purveyors that New York’s famed Russ & Daughters use, so the bases are loaded. There is also a case with grab-and-go items, and you can bring home smoked fish and their famed pastrami too. Check out the menu online here. Pay special note to the Bodega Egg & Cheese (cage-free egg omelette, aioli, and melted Tillamook cheddar on a bialy, and you can add their house breakfast patty made from chicken and pastrami with typical breakfast spices). Since there are only 10 seats or so, it really is meant to be a takeout situation here (just wanted to manage expectations before you schlep over). Initial hours are Mon-Fri 7am-3pm and 8am-3pm on the weekend. 1520 Fillmore St. at Geary, 415-872-9046. The new Bacon Bacon café in SoMa. Photo courtesy of Bacon Bacon. Fans of the ~BACON BACON~ truck, or their café in Upper Haight/Cole Valley, will be happy to know there is now a second brick-and-mortar location in SoMa, right by AT&T Park. 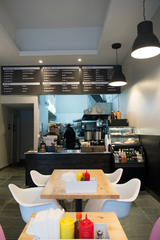 Like the Haight café, the menu is more expansive than what you find on the truck. For example, there’s a very popular breakfast burrito (with scrambled egg, pulled pork, bacon, avocado, cheddar, Momma Lil’s peppers), and at lunch, there is a Cubano and three different salads (and one of them is bacon-free, so if you have a non-bacon-loving friend, they have that option). The breakfast hours are pretty dialed: while you munch on a maple bacon scone, you can grab a cheddar-bacon scone for your coworker while your cappuccino is being made (they use beans from Roast Co.). The menu also includes a Havana latte, made with sweet condensed milk (take it easy on that one). Hours for now are Mon-Fri 7am-3pm and 8am-3pm on the weekends. Once baseball season kicks in, look for expanded hours until 8pm. Owner Jim Angelus tells me they are developing some new additions to the menu that will be easy to carry to the game. They also deliver via Caviar, so the SoMa side of town has a new outpost to order from. 737 3rd St. at King. Mo in front of the future location of Dip. Photo courtesy of Tiki Ink Publicity. Mo inside the upcoming Dip. Photo courtesy of Tiki Ink Publicity. A well-known face and character in North Beach, Mahmoud “Mo” Khossoussi, the owner of Maykadeh and Mo’s Grill, wasn’t too keen on his retirement after 53 years in the restaurant biz. 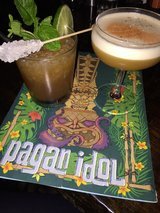 The 70-something self-made man explained to me, “I got bored.” So now he’s collaborating with his daughter, Haleh Cunningham (who will be working on the creative direction), to open ~DIP~, his next restaurant. Khossoussi has quite the compelling history: he moved the U.S. from Tehran when he was 17. He didn’t speak English, but look who went to Cal Poly and Cal State Hayward and studied accounting and economics. He opened his first restaurant in Castro Valley in 1969, while he was in college, because he needed to support himself. He went to school during the day and worked at the restaurant at night. Turns out, you just can’t just tell a hard worker to retire and take it easy. It ends up his family (including his granddaughters) are all in love with dip sandwiches, like a French dip, so he decided to to finally pursue this idea that he’s had for a long time. Dip is going to be a sandwich shop, serving au jus sandwiches made with organic meats and Acme bread. There will be grass-fed beef (a cross between Tuscan beef and Angus), lamb, nicely marbled pork (sourced from Salmon Creek), and a pork belly sandwich, too, all served au jus. There will be pickles and Dip’s own mustard on the side, plus the option to order potato gratin and other vegetable dishes. Delivery will also be available. The space will have a butcher shop look, with white subway tile, wood, and brass details. It was formerly a clothing store, and after going through all the change-of-use permits, they are finally under construction and hope to open in May. Way to go, Mo! 1318 Grant Ave. at Union. Rodrigo Duarte of Caseiro é Bom slicing some pata negra (with his little helper). All photos: © tablehopper.com. The bountiful table at Caseiro é Bom. A cute meat man from The Meat Market with their faux pho. 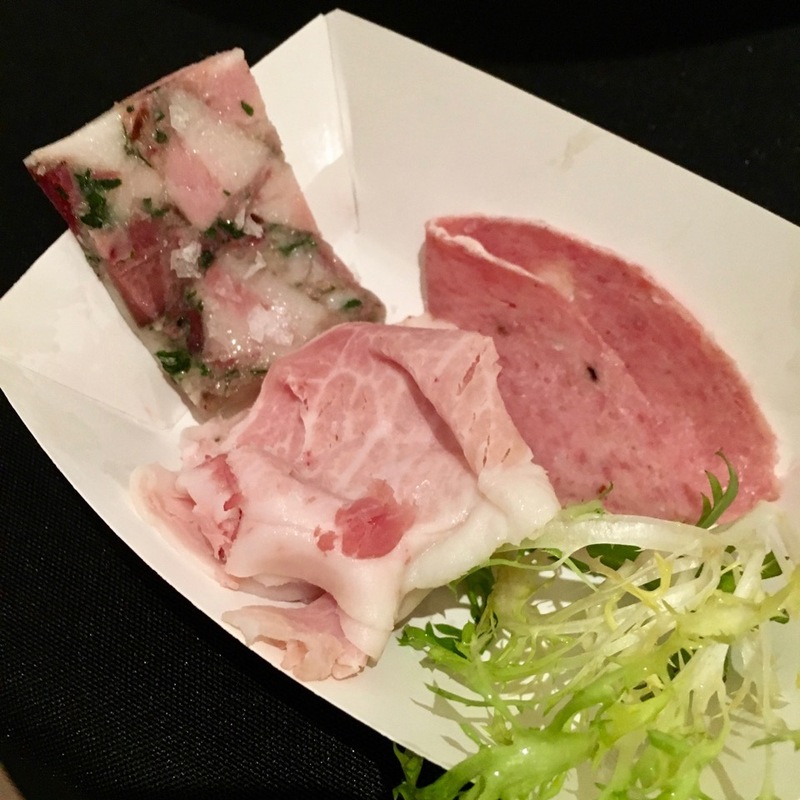 There are some events you simply cannot miss, and that was entirely the feeling I had when I first heard about Charcuterie Masters, hosted by NY Epicurean Events. And since it was being hosted at Flushing Town Hall in Queens, it felt like a subway adventure too! I was excited with the prospect of learning about local charcuterie and salumi makers, all in one spot. The most exciting table for me was Caseiro é Bom, a Portuguese shop in Newark that I can’t wait to go visit. Owner and butcher Rodrigo goes through 30 hogs a week, and when you see the vast array of meats and products, you’ll understand why. He is a man obsessed. His table was positively overflowing in product, and he wanted you to taste it all. Sure, okay—if you insist. His pata negra was astounding, aged 36 months (and the only pata negra in the U.S.!). He raises his own animals on a farm in New Jersey, and the rich flavor in his jamón says these animals are raised with exquisite care. He’s going to be adding 10 purebred black Iberian pigs to his farm as well, as soon as they make it out of quarantine. Read more about this amazing butcher here. I can’t wait to head over for more of his chorizo alentejano! The folks from Dickson’s Farmstead Meats in Chelsea Market offered a tasting plate of their rich mortadella, herbaceous and silky headcheese, and my very favorite, their ham! Going back for a quarter pound of that—am already envisioning it on a baguette with some butter! 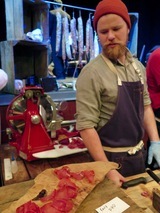 And they’re also a great butcher shop, highlighting artisan meats and sourcing from sustainable farms in New York. My friend and I went bonkers for the freshly made pâté from Ridgewood European Pork Store—so glad I was able to bring a chub home, that stuff was gold, with perfect texture, seasoning, and flavor. I love that the owner suggested it on a plain bagel for breakfast. Now we’re talkin’. Some other favorites: the culatello and coppa Calabrese from Møsefund Farm, the nation’s largest Mangalitsa pig farm; the spicy soppressata from Oui Charcuterie; the full lineup of meats from Great Barrington’s The Meat Market, but especially their bresaola-like “faux pho” with pho spices. I also cracked up over how much ‘nduja people are making—was great to see the ‘nduja and finocchiona from ‘Nduja Artisans there, the makers of my favorite domestic ‘nduja! Mela Tandoori Kitchen in Civic Center hosted a couple interesting guests a week ago, starting with ~Jus Reign~ (Jasmeet Singh), the YouTube star and Bollywood actor who was recently in the news for being forced to remove his turban at the airport by the TSA (he’s Sikh). To be clear, the issue was about not having to remove his turban, but about the TSA not providing a private room with a mirror so he could put his turban back on. You can watch his video breakdown of what happened—and you should. It’s a teaching moment (and also funny as hell). The night he ate at Mela he was appearing at the Empire Room (across the street) and was reportedly a fan of the chili cheese naan, chicken tikka masala, and faluda for dessert. Another faluda fan was ~Amir Khan~, British professional boxer and two-time former world champion and current WBC Silver Welterweight title holder—he will be fighting in Las Vegas on May 7th against Canelo Alvarez. He stopped by with his NY socialite wife, Faryal Makhdoom, for his favorite tandoori mixed grill and chai.